In front of more than 5,000 fans, Pittsburgh Riverhounds SC (2-1-2) put on a show in its home opener, defeating Hartford Athletic (0-6-0), 3-1, on Saturday at Highmark Stadium. At the center of the Hounds’ scoring opportunities, Steevan Dos Santos and Kevin Kerr got on the scoresheet, in addition to Neco Brett. Here’s how the club notched a season-high three tallies. Like he has done many times before, Kerr created offense inside of the 18-yard box. 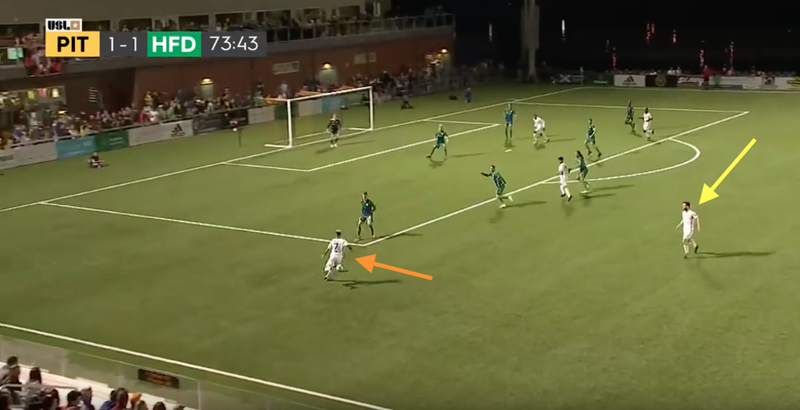 Sprinting to the end line before changing course back toward the field of play, Kerr (yellow arrow) eludes a Hartford defender. 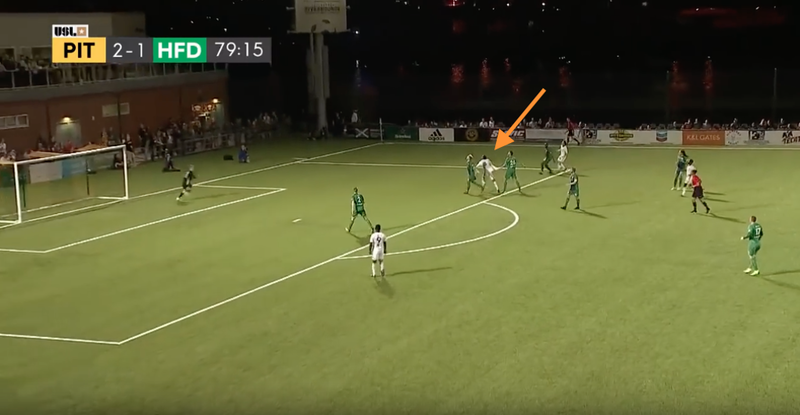 The longest-tenured Hound then sends a ball toward the goalmouth, and Dos Santos (orange arrow) uses his large 6-foot-4-inch frame to his advantage to place a header into the back of the net, giving Pittsburgh an early 1-0 advantage. 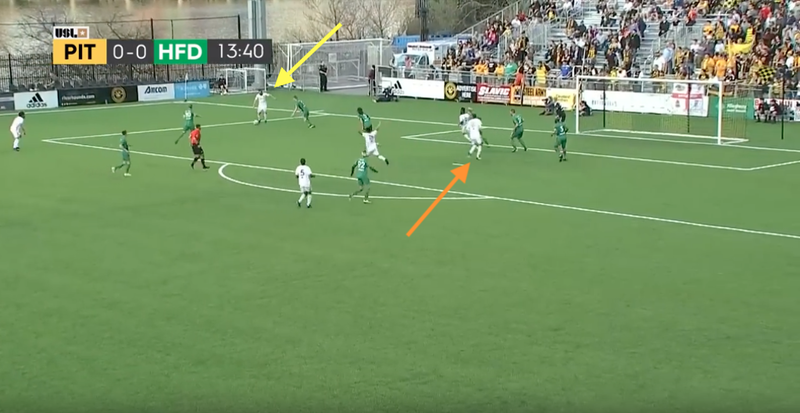 Creating space with a short run down the left flank, Ryan James (orange arrow) differs to an open Kerr (yellow arrow) back into the center of the field. Seen above, Hartford packs numbers inside of the penalty box. Due to the congestion, the midfielder does not have a clear passing lane or option to which dish the ball. 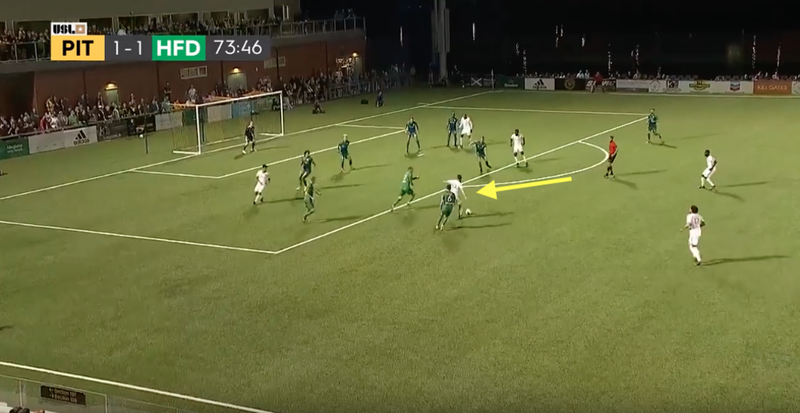 Realizing this, Kerr finds space near the top of the 18-yard box and lets go of a blast, which ultimately beats the Hartford goalkeeper to the bottom-right corner, making the score 2-1 Hounds. Before Brett struck home his second penalty kick in his second straight match, Dos Santos’ work rate earned the Hounds a golden opportunity. Using his size, the striker (orange arrow) maneuvers around the defense just inside of the penalty box. By doing so, he draws a foul as the Hartford defender brings him to the ground with a jersey pull (seen above). Brett then finished the job with a powerful strike to bring the score to its final of 3-1. The Hounds once again relied on their high pressure to provide them with an 18-to-9 total shots advantage and three points on home turf. Pittsburgh out-touched Hartford inside of the attacking 18-yard box, 32-11, in addition to playing 27 percent of the match in the Athletic’s defensive third (only 16 percent in the Hounds’ defensive third). ©2019 Pittsburgh Riverhounds SC - USL / SportsEngine. All Rights Reserved.